Since 2014, Patriots Overhead LLC has been providing outstanding garage door installation service to Medfield, Massachusetts homes and businesses. Whether you're looking to having a garage door installed on your residential or commercial property, Patriots Overhead LLC's the name you can trust. We are known for our quality workmanship and superior customer service. 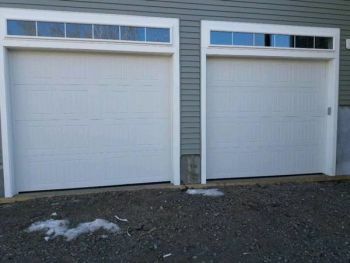 We work with all styles, types, and brands of garage doors. When our knowledgeable technicians arrive to install your new garage door, they have your satisfaction 1st on their priority list, and will make sure your garage door installation in Medfield is completed to your expectations. Why hire Patriots Overhead LLC when you're looking for Medfield garage door installation? Safe - The safety of you, your family, your staff, your pets, your guests, and anyone else always comes first! The staff at Patriots Overhead LLC is trained to make sure your Medfield garage door installation is completed correctly and inspected in the end for any problems. Quick - We value your time, and that's why we want to make sure your garage door installation in Medfield is completed in a timely fashion. Neat - It's frustrating when you hire contractors who leave a mess for you to clean up. At Patriots Overhead LLC, we make sure that we don't leave anything behind once the garage door installation is complete. Quiet - We want to minimize any disruptions to you or anyone else around you, so whenever possible, we'll always make sure to keep the noise level to a minimum. Call the name you can trust for garage door installation in Medfield, Massachusetts. Call Patriots Overhead LLC!